I had just walked around L’Eixample for three hours or so, following a route that took in various Modernist buildings, and finished down by Plaça Catalunya. I had originally planned to head off to a restaurant recommended in one of the guide books but couldn’t find it on my map and, anyway, it would have been another 10 minute or so walk so decided on one that I passed just before the end of my itinerary El Glop – Taverna del Teatre (the theatre in question being Tivoli cinema house). The problem with eating anywhere in Spain is that there are so many places to choose from. A good few years ago I read that there were more eating/drinking venues in Spain than in all of the rest of the EU combined. That might not still be the case as the EU has got so big but the choice is still huge (TripAdvisor lists 5,514 eating places in Barcelona!) and you don’t know what sort of risk you might be taking, especially so close to the centre of the tourist area. Here I think I should say something about the walk I had been following. Way back in the 90s when I first started coming to Barcelona I happened on a book of 5 walks around the centre of the city. These walks were so devised as to not only take you to a different part of the city centre but also in a way so you could concentrate on a particular style of architecture or historical period. I’d done the other four so this day I did the final one. The book is called BarcelonaWalks by George Semler, Henry Holt, New York, 1992. Don’t think it’s still in print but it will be available on the internet and is a good introduction to what the city has to offer. I’ve come across a few mistakes, minor errors in street numbers, for example, but that doesn’t detract from the value of the book in general. 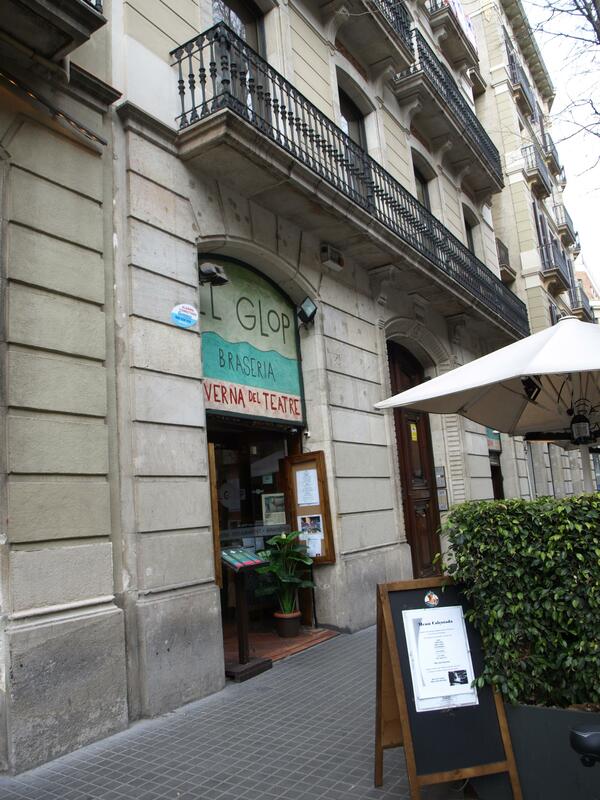 El Glob – which means ‘gulp’, ‘swig’, ‘mouthful’ or something along those lines – was offering a midday menu for €10.70. The restaurant has a very narrow frontage with a handful of tables out on the street. These were full (although it was just at the start of the Catalan lunchtime) so I went inside and was surprised to see that it went way back, getting much wider after the long bar and cooking area. Perhaps I was lucky the outside was not available. Although it had been quite warm in the sunshine walking around I think it might have gotten a little uncomfortable sitting still for an hour or so, the air temperature still being relatively low. There were 5 options for the first two courses. It will not come as a surprise that paella was one of them. I thought that this always appeared on a Menu to pander to the tourists but talking to a Catalan friend he said that he would, from time to time go for the paella, and that on Thursdays all places in Catalonia offering a Menu would have paella on the list – that was something I hadn’t realised before. One thing to remember about this particular dish is that it often is only available for a minimum of two people. For the starter I chose the Escalivata with anchovy. This was something new to me. It consists of onions, sweet red pepper, aubergine and tomato, all having been previously cooked but served cold. They are presented in a line across the plate and an anchovy placed on top. Being a cold dish it was quite refreshing. I had cause to stop and think when I tried the tomato. Why is it not possible to get decent tomatoes in Britain? I can’t remember the last time I bought a tomato that had any taste, even during the tomato ‘season’ in the summer. I don’t go chasing around so-called farmers markets to find the sweetest (shopping for me is a necessity not a life choice). Perhaps I’m expecting too much from the nearest large supermarket but if they don’t have them who does? If I can eat a decent, tasty tomato in Barcelona in February why can’t I do so in Liverpool? I hope that changes taking place in Spanish shopping habits don’t lead to the same ‘lowest common denominator’ approach. I always used to say to people I took around Spanish cities to have a look in the markets in order to see the quality of the food on sale as compared to Britain but even those places, like the Boqueria off the Rambla in Barcelona, are being turned into tourist gastro traps rather than markets. The same happened with the Mercado Sant Miquel next to the Plaza Major in Madrid so perhaps blandness could be on the way for the Catalans/Spanish in the not too distant future as more shopping is done in supermarkets. To drink I again opted for the red wine. This came in a half litre carafe, so I have no idea of where it came from (probably a keg) but thought it was quite good, full-bodied and fruity. Better than the wine served at Le Nou, although there quantity made up for quality. One thing that I’d forgotten about drinking red wine in Catalonia is that it’s always served cold, not just in the summer. Some might find this a bit odd, in fact I still do. Once you learn about wines and then think you know a little about them it’s likely that you come to the understanding that reds should be served at room temperature. Not is Spain. The trouble is I’ve never let the wine stand long enough on the table to test whether it improves as the temperature increases. Sitting not too far from the entrance I was able to get an idea of the customers. Obviously a problem that all tourists face when they travel is lack of local knowledge. I was staying with friends on the outskirts of the city and could get recommendations there but for the centre of Barcelona I was like most other visitors. Having chosen ‘blind’ it was good to see that the majority of those who came in after me where obviously locals who returned on a regular basis. How am I so sure that these were Catalans as they entered? Their form of dress. Although I had been walking around allowing the sun to caress my bare arms on Montjuic (a few days before) and L’Eixample this particular morning the overwhelming majority of locals still considered it was winter. The standard winter clothing for Catalan women is the padded, quilted jacket, together with a scarf. For the men similar long scarves with leather bomber jackets. I had confirmation of their status as they passed me. I was sitting with my jacket on the back of my chair and could read their thoughts through their looks of astonishment. To a Catalan I must have only recently escaped from an asylum which would not have been the reaction of most other foreign visitors. Before my order had been taken I had noticed a number of plates of ‘albondigas’ – meatballs – going passed and thought to try them. They are normally a good standby on the menu. When they arrived they were in a thickish tomato sauce, in which were strips of carrot, sweet red pepper, onion and peas. The sauce was tasty but I’ve still to decide on the meat balls themselves. In consistency and taste they seemed like spam to me. I haven’t come across that before and still don’t know if I would choose again if it was on offer. It might be worth mentioning here that you don’t normally get vegetables with the main, apart from possibly chips, so if you insist on some sort of balance think about this when ordering. The dessert is normally quite simple and I chose the ‘macedonia’, the mixed fruit salad that came served in a small wine glass. I thought this was quite a good place. The service was efficient and I was not hurried. The place got busier the closer it got to 15.00 but it was big enough so it didn’t seem like a crush. One touch I quite liked was the waiter asking a lone man who left to use the services whether he had left ‘alguna cosa importante’ (anything of value) in his bag at the table. I later realised that this restaurant was part of a small local chain in the city, something that’s still quite unusual, but would have no problems trying any of the others if they were nearby at lunch time. The last thing to note is you don’t pay the waiter. Take the bill that would have been left on the table to the till. Just off the bottom of Passeig de Gràcia, near to Plaça Catalunya.